Nowata's Historic Main Street is a member of the Oklahoma Main Street Program which strives to preserve buildings, promote economic activity, and recruit new businesses in the historic downtown business district. From the county seat of Nowata County, " No-we-ata"! 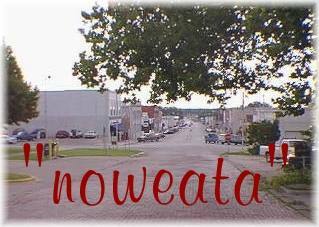 The county and city name, Nowata, is derived from a Delaware Indian word, noweata, meaning "welcome." According to one story, two railway surveyors rented rooms from an educated Cherokee woman and asked her for possible station names for towns along the line. The woman suggested "Noweata." There are two stories of how the spelling changed; one is that the post office misspelled the name of the town in their official records; another story tells of how a drunken painter misspelled "Nowata" on the depot and the name stuck. The town that became Nowata can trace its roots back to 1868 when a trading post was established. The community was first called California Station. When, on November 1, 1887, the first post office was established in the fledgling town, it was named Metz after the postmaster, Fred Metzner. Then, when the Iron Mountain Railway completed a road to Nowata in 1889, the town was recorded. In 1892, the Cherokee Nation set up the townsite of Nowata and it was incorporated by the Federal Government in 1904, and was chosen as the temporary county seat. It won the permanent seat position in the 1908 election after a spirited contest with Delaware. The original courthouse was destroyed by fire on January 30, 1909. The new building was completed in 1912 at a cost of $69,594.64. The mural painted on the building in the 100 block of South Maple keeps the heritage of Notawa in our forefront as it exemplifies our progress in becoming a proud part of our state and nation. Belle Starr .... "Queen of the Bandits"